When one looks at the historical data available in public domain, it is clear that IQD has always been the same or around the value of KWD. Why are they far apart? Let’s us look at 2 of the major economic indicators of both countries. These are oil and gold. Before we begin, let’s understand the assumptions behind this writing first. It is assumed that both countries’ major source of income are coming from oil production and both have sufficient gold reserve that makes their currencies valuable and at par. Of course there are other economic components that we are not going to touch. 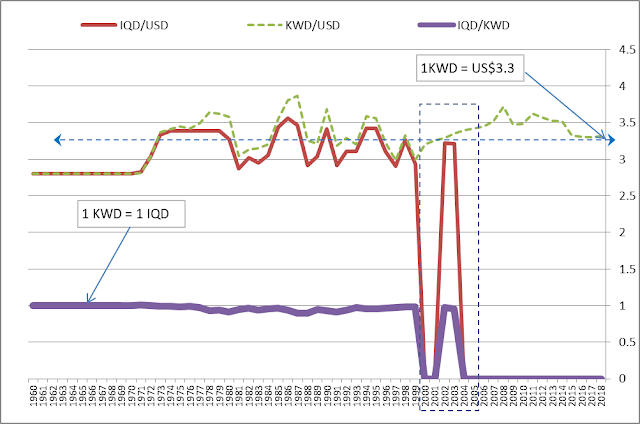 Let’s begin by looking at the historical IQD and KWD relative to each other and United States Dollar (USD) from the chart below. Source: http://fxtop.com/en/historical-exchange-rates.php (1 July 2018, processed). From the chart, one can see that historically since 1960, IQD (purple line) has always been in the range between 1 – 0.97 to KWD (red line) until 2000 - 2001 when it dipped to 0.0002. Interestingly, it went back to 0.97 in 2002 – 2003 before it plunged to 0.00024 (average 1 KWD = IQD4,100) in 2004 until to date (2018). Correspondingly, IQD value relevant to USD follows the same trends (average 1 USD = IQD1,198). Strangely, KWD (dashed green line) value remains relatively stable at USD3,30/KWD since 1960. 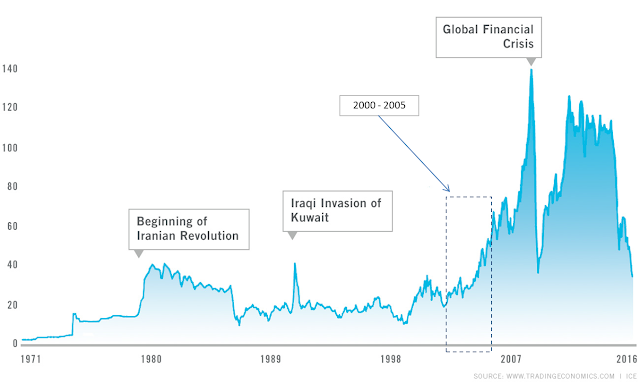 The chart does not show revaluation of KWD purportedly took place in 1991 when Iraq invaded Kuwait. But then this happened in 1991 and was not captured in the historical data! On different angle, it can be argued that given the history of both IQD and KWD that was always at par on 1 : 1, KWD was revalued against IQD twice. First, between 2000 – 2001 and second, 2003 – 2004. In the next paragraphs, let’s assume that KWD is always stable against USD at USD3.30 and correspondingly, stable toward IQD at 1 : 1. The chart below was plotted to show the value of IQD/KWD (red line) against both Iraq (blue line) and Kuwait (light-green line) Gross Domestic Product (GDP) in Billion USD. It is clearly seen that both Iraq and Kuwait have enjoyed increased GDP having almost similar pattern and trends. Why IQD/KWD value dipped in 2000-2001 and 2004? One of the reasons of looking at the world oil prices is to see whether USD as Petrodollar has influenced the revaluation of KWD against IQD. The data shown in the graph above suggests that there is no correlation between the revaluation of IQD/KWD with the world oil prices as the prices sharply increased. This means, both countries enjoyed financial benefits from selling oil. Both Iraq and Kuwait main sources of income are coming from oil production at 99% and 89% respectively (Source:http://www.worldsrichestcountries.com/top-iraq-exports.html). Thus, logically speaking both countries enjoy the rising oil prices. But, why KWD was revalued against IQD and subsequently IQD towards USD? If the case is linked to USD, there is no plausible explanation as both Iraq and Kuwait during 2000 – 2005 were exporting their oil denominated in USD. Let’s see the data on Iraq and Kuwait’s oil production. Both countries’ oil productions appear to be stable for the period of 2000 – 2005 with upward trend within which Iraq production is more than Kuwait. Traditionally, Iraq produced more oil than Kuwait. To date, Iraq production of oil of 4,380 Blue Barrel per day/1000 (BBL/D/1K) is almost double that of Kuwait. Now, let’s see the relationship between IQD and KWD from both countries gold reserves. It appears that this is where the root cause of the KWD revaluation against IQD as it is obvious from the graph that Iraq has no gold being reported as its reserve from 2000 – 2004. Another way of stating this is that KWD departing itself from its traditional 1 : 1 relationship from IQD relevant to the gold holding of Iraq. Could this be the main cause of the revaluation? 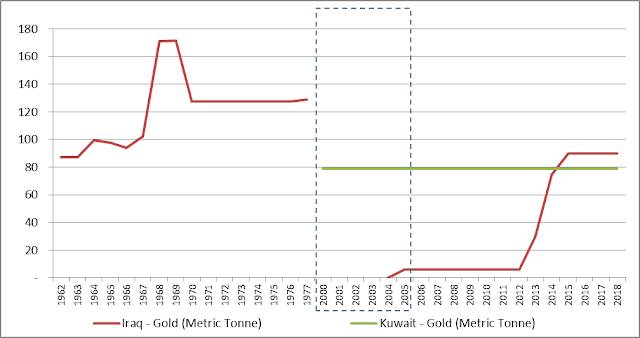 Despite Kuwait’s gold reserve data for 1960 – 2000 is not present, it is apparently stable in the range of 80 metric tonne for the period of 2000 – 2018. Correlating this with IQD/KWD relationship since 1960, IQD had been significantly at par on 1 to 1 with KWD and the graph below suggests that Iraq has always got more gold reserve than Kuwait which is on average above 100 metric tonne. From the graph, it can be seen that Iraqi’s gold of 127 metric tonne have disappeared in 1978 and started to be recorded by World Gold Council (gold.org) in 2005 from 5.9 metric tonne. Where did the 121 metric tonne of Iraqi’s gold go? Where is Iraqi’s gold reported from 1960 – 1977 and why there was no record from 2000 - 2004? Will Iraq be able to get them back? Interestingly, IQD/KWD revaluation happened within this time frame (2000 – 2004) and during which IQD has been at 4,100/KWD or 1,190/USD. These values linger till to date. What is happening with IQD? If macro-economic data of Iraq and Kuwait are correlated, there seem to be non-technical reasons that have been affecting IQD value. Could this be linked to Iraq’s gold reserve? The data suggest that by 2015 IQD—when Iraq gold reserve is approaching 100 metric tonne—should be about the same as KWD at 1 : 1. Why to date this has not happened? It appears the main reason is political and has got very little to no relationships with macro-economic and the wealth of Iraq. Could this be changed by President Trump? Since 2015, using Iraq’s gold reserve as benchmark which has been steadily increased to beyond Kuwait’s, the future of IQD’s value looks similar to KWD that is USD3.0 – 3.3 using IQD 1 – 0.95 per 1 KWD. Or could it be the difference in the money supply of the two countries? I honestly don't think its the money supply as much as the government of Kuwait is a constitutional emirate, with a semi-democratic political system. It is also has a much smaller number of politicians. Moreover they are not heavily dependent upon another country for water, or electricity. Being a semi self contained state has unique advantages. Until Iraq can stop depending so heavily on other countries for electricity they are going to have a hard time. Additionally, that fact that Turkey and Iran have blocked shared resources (Tigris & Euphrates) from Iraq, I think that is criminal, and they should be sanctioned for that as well. The article is interesting indeed. I've seen similar ones before trying to justify why Iraq has to RI/RV by comparing it to Kuwait. What I don't see is anything being mentioned about what was going on during the 23 year gap (Gold Chart). Wars are expensive to maintain and Iraq went through 3 of them during that time period, and all the pilfering that was going on. What would be more interesting if Maijanfad would use data that determines the actual rate of exchange, without all the assumptions, to see if their conclusions would be the same. Maijanfad would get bonus points if they would include other countries that are oil based, and in the area, to see how that would all work out. Since the topic is "Why Iraqi’s Dinar (IQD) should be around the value of Kuwaiti’s Dinar (KWD) at USD 3.3", what if were reversed? The KWD should be at the value of the IQD ($0.0008)? If Maijanfad gave that some thought, they should realize why each country has the rate it does now. I like that take!!! Maijanfad did make comparisons of different currencies at the Gold standard, but not specifically OIL RICH countries. That would be an interesting comparison. Below is another article he wrote where he made comparison of other countries currencies based on the aforementioned Gold standard. We all have seen rates for Zimbabwe Dollar (ZIM), Indonesian Rupiah (IDR), Vietnamese Dong (VND), Iraqis Dinar (IQD) and Iranian Rial (IRR) frequently cited by the intel providers and wondering where did they get them from. Until to date we continue to wonder not only for the sources of those alleged rates but also the likelihood of what the rates might actually be like when the gold standard is reintroduced. United States (US) government de-pegged US Dollar from the gold standard in 1971. Let’s assume that the gold standard is reintroduced using the 1971 exchange rates. Using historical exchange rates given below, we could anticipate the rates that are likely to be used when the gold-backed US Dollar is reintroduced. Based on my analysis, the currency that has a potential of going forward for revaluation (RV) through re-instatement (RI), with- or with-out NESARA/GESARA, is IDQ due to not only its macro-economic indicators but also its relationship to Kuwait’s Dinar (KWD). If they are going to assume, based on gold, then they would need to account for the current gold supplies. They have gone up and down through the years since 1971. They are also assuming that the US dollar would be re-introduced, being gold backed. If that's the case, what would that value be today, and comparing it to the other currencies of interest. They seem to be also missing that if the US dollar gets gold backed, then the IQD, KWD, etc also gets gold backed and we all would have different currencies that we would be using. Under their assumptions , of course.